WASHINGTON, D. C. -- Eighteen percent of all adults worldwide -- or 29% of the global workforce -- reported being self-employed in 2013. But rather than a positive sign of proactive entrepreneurial energy, high rates of self-employment can often signal poor economic performance. The self-employed are three times as likely as those who are employed full time for an employer to be living on less than $2 per day. The bulk of the self-employed live in some of the poorest places in the world, where self-employment may be born more out of necessity than opportunity. One in four or more adults in Southeast Asia (28%), East Asia (28%), and sub-Saharan Africa (25%) are self-employed and make up large segments of the region's workforce. The self-employed account for much smaller percentages of the population and workforces in the former Soviet Union (7%), European Union (6%), and Northern America (5%). Gallup's latest employment status measurements are based on more than 135,000 interviews across 135 countries in 2013 where adults were asked numerous employment questions modeled after those asked by the International Labour Organization (ILO). In line with the ILO standards, Gallup counts adults who work 30 hours or more per week for themselves or their family's business or farm, and do not work 30 hours or more per week for another employer, as self-employed full time. Gallup tracks the percentage of the population employed full time for an employer (Payroll to Population, or P2P) worldwide because this metric has proven to track closely with overall economic performance. 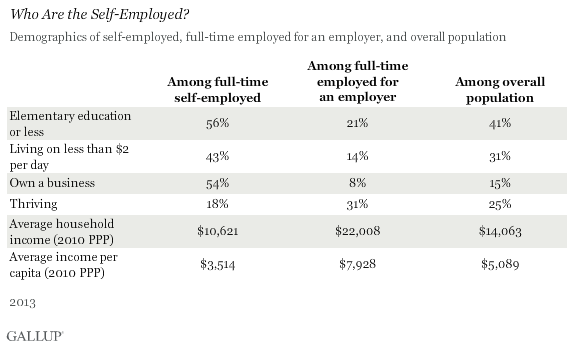 Part of the reason that Gallup does not include the full-time self-employed in this figure is that this group looks and behaves differently from those employed by an employer. 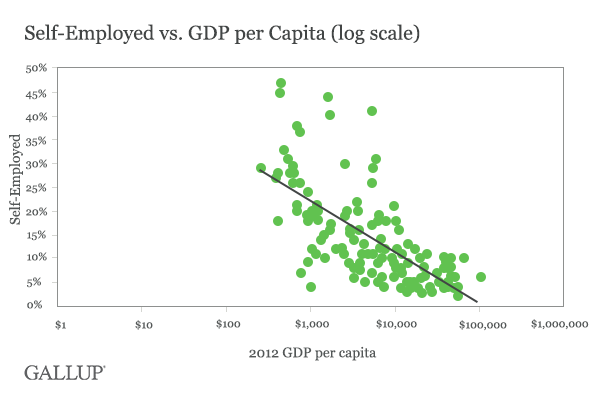 While GDP per capita rises along with the P2P rate, the opposite is true of self-employment. Worldwide, the self-employed report lower incomes than the overall population. They are three times as likely as those employed full time for an employer to be living on less than $2 per day and bring in less than half as much in household income on average. They also rate their lives lower than those employed full time for an employer or the general population. Only 18% of the self-employed rated their lives highly enough to be considered thriving in 2013, on par with the unemployed. By comparison, 25% of the population overall and 31% of those employed full time for an employer were considered thriving in 2013. Related to their lower incomes, self-employed individuals are typically less educated than those employed full time for an employer or even the general population, but this varies considerably from region to region. 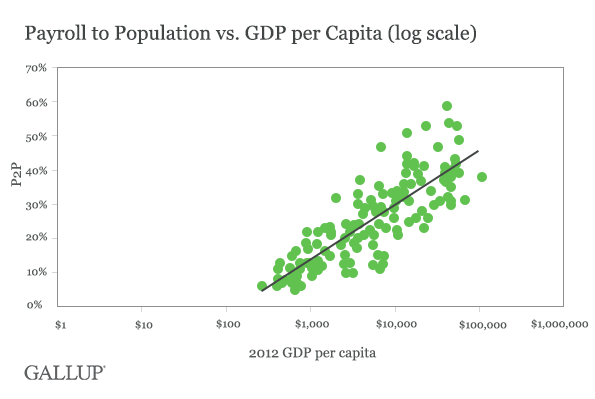 In wealthier and more developed regions such as Europe, Northern America, and Australia-New Zealand, the self-employed tend to be better educated than the overall population and have incomes comparable to those who are employed full time for an employer. However, in less developed regions with high rates of self-employment, these workers are much more likely than the general population to have only an elementary education or even less and to be much poorer on average. Not all self-employed workers describe themselves as owning a business, and not all business owners describe themselves as self-employed. However, these groups do overlap a great deal in economically advanced regions: More than three-quarters of self-employed adults in Australia-New Zealand (94%), Northern America (80%), and the EU (76%) say they own a business. However, in regions with the highest self-employment, only about four or five in 10 self-employed adults say they own a business. Regions with the highest rates of self-employment also tend to have the largest "informal economy" sectors. Only three in 10 or fewer self-employed business owners say they have formally registered their businesses in Southeast Asia (30%) or sub-Saharan Africa (26%). 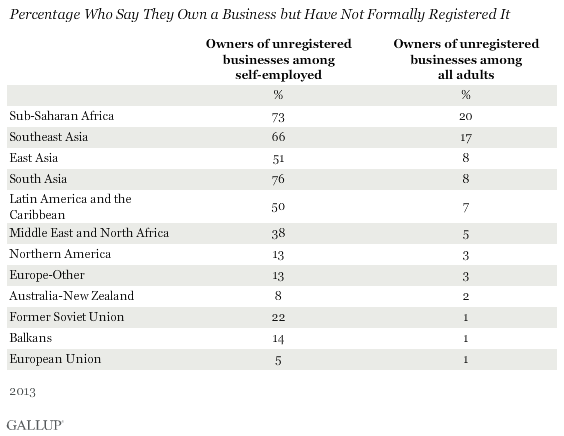 Overall, more than one in six adults in these regions report that they own unregistered businesses. When economists and opinion leaders talk about the self-employed, the typical example people in the U.S. think of is the freelance professional or contractor who has struck out on their own to succeed on their own terms. They picture an entrepreneur, or at least a plucky individualist. This is indeed a common form of self-employment in more developed economies, but in much of the world, self-employment is more often an alternative to complete poverty. Rather than the energized professional, the more typical example of a self-employed worker worldwide may actually be the fruit stand vendor, the homesteader, or even the subsistence farmer. Even in the developed world, many individuals find themselves forced into self-employment by adverse circumstances. While some of the self-employed choose their work and life purposely, many are forced into it because they cannot find a good job with a reliable employer. These different types of self-employed workers mean different things for the countries and economies they work in, and call for different policy responses from national and world leaders.